The HP PageWide 377dw: Not Laser. Not inkjet. It’s the best of both. A new alternative for business printing. Fastest in its class, the HP PageWide 377dw delivers professional-quality color documents, fast two-sided scanning, and best-in-class efficiency, all at a low purchase price. Easily print PDF and JPEG files from a USB drive and manage your tasks with the 4.3-inch color touch screen. No network needed to print from your mobile device, use NFC touch-to-print technology or Wi-Fi Direct®. Main functions include: Auto 2-sided color printing and scanning, copy and fax. Wireless printing, AirPrint, Wi-Fi Direct, 4.3-inch color touchscreen, remote printer management, dual input paper trays and more. Speed: Wait less, do more. HP PageWide Technology delivers best-in-class print speeds—as fast as 45 pages per minute—for both color and black-and-white and a monthly duty cycle of up to 40,000 pages. 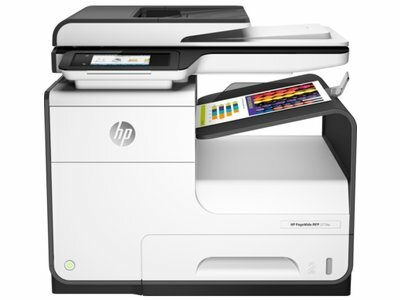 Value: HP PageWide printers offer up to 40% lower color cost per page than color laser printers. Eco-conscious choice — has one or more meaningful eco-attributes or eco-labels. ENERGY STAR® certified — meets federal guidelines for energy efficiency. Display: Manage your print jobs with ease with the 4.3-inch color touchscreen on the PageWide 377dw. Paper sizes supported: Tray 1: Letter, oficio, legal, statement, executive, 3 x 5 in, 4 x 6 in, 5 x 7 in, 5 x 8 in, envelopes (No. 10, Monarch); Tray 2: Letter, statement, executive, envelopes (No. 10); Tray 3: Letter, oficio, legal, statement, executive. Choose Original HP cartridges: Use Original HP 972A ink cartridges for great results print after print. What’s in the box: J9V80A HP PageWide 377dw Multifunction Printer; HP 972A Setup Black PageWide Cartridge (~3000 pages); HP 972A Setup Cyan PageWide Cartridge; HP 972A Setup Magenta PageWide Cartridge; HP 972A Setup Yellow PageWide Cartridge (CMY composite ~1500 pages); power cord; phone cord; installation guide; CD-ROMs (for software, Windows and Mac printer drivers, and User's Guide). Warranty information: One-year limited hardware warranty; 24-hour, 7 days a week Web support. 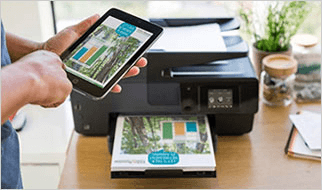 Faster1 than any color MFP in its class, HP PageWide delivers professional-quality color documents, fast two-sided scanning, and best-in-class energy efficiency2—all at a low purchase price. Best-in-class print speeds,1 fast printing from sleep mode, and single-pass, two-sided scanning keep productivity on track. Documents are ready fast, so there’s less waiting. Minimize interruptions and downtime with efficient, reliable performance. Conserve resources and use less energy than laser printers,2 with HP PageWide Technology designed for today’s busy office. HP PageWide is designed with fewer moving parts. The stationary, page-width print bar enables unmatched speeds, improved reliability, and fewer replacement parts, all with professional print quality at the lowest total cost of operation in its class. Save time and reduce waste with two-sided scanning that captures all your data in a single pass. Easily print from your smartphone, tablet, and notebook at work, home, or on the go. 2 RJ-11 modem port/phone line.